I should some get credit for Lowlight #8. The fact that Pakiland fared worse than India on WHI for the first time in history was brought to your notice by me first, if I am not mistaken. Wish you and all your readers a very happy new year. KARACHI: For the third year in a row, Pakistan equity markets provided healthy returns to the investors. The KSE-100 index added 6,870 points to cross over the 32,000 level on the last trading day on Wednesday, generating return of 27 per cent for the year. Though lower than the return of 49pc for each of the preceding two years, 2012 and 2013, the index gain was in line with the last 10-year average gain of 26pc and 20-year average of 21pc. According to calculations by international market monitors, Pakistan ranked the third best performing market in 2014 and stood out among the 10 top markets around the globe. Among the Asian frontier markets (as categorised by MSCI), Pakistan stood out as the top performer, outpacing Sri Lanka, Vietnam and Bangladesh. Analyst Muhammad Tahir Saeed at brokerage Topline Securities observed that in spite of political upheavals, Pakistan remained one of the best performing markets led by foreign investors. “Government’s secondary market offerings, energy sector reforms and declining yield on government papers helped the bull-run in 2014,” asserted analyst Saeed. Back of the envelope calculations showed that due to appreciation of 4pc in value of Pak-Rupee against the US-Dollar, gain in dollar terms turned out to be 31pc. Price-only (without dividend) KSE-100 Index was up 18pc (22pc in dollars) in the outgoing year. Besides improving macros, major impetus to the market in 2014 came from higher foreign inflows. Foreign investors who hold $6.1 billion worth of Pakistan shares which accounts for 33pc of free-float and 9pc of market cap, remained net buyers in 2014. During the year, overseas investors bought $2.4bn and sold $2.0bn worth stocks, resulting in net inflow of $386m. This was in spite of $46m outflows in Dec 2014. The foreign fund managers had bought Pakistan equity in the net sum of $398m in 2013. Market watchers said the outgoing year would also be remembered for mega public offerings led by sale of shares by the Government from its holdings. In all new offerings in 2014 stood at nine compared to three Initial Public Offerings (IPOs) in 2013. After a gap of 7 years, the equity markets raised Rs73bn through new offerings in 2014. Analyst Muhammad Mobeen at JS Global observed that his house expects the market to gain momentum in the new year with textiles and banks as the preferred sectors. Brokerage Sunrise Capital stated in its report that the KSE could have performed even better but for political protests and sit-ins, which scared investors. Top three contributors in terms of points to bull run of 2014 were banks, chemicals and cement sector. “Banking sector surged by 28pc or 1,517 points in CY14, chemicals contributed 843.8 points in index surged by 42pc while cement that rose by 58pc added 795 points to the index”, analysts calculated. Currently what is the m-cap of all KSE listed companies and how does this in relation to Pak's nominal GDP? What in your opinion are the sectors to watch out for potential investors in KSE? Many markers are improving in the Subcontinent but they could be even better. What I am noticing for quite some time now many indices are flat lining in Pakistan whereas, India & Bangladesh are positively steeper. Although Pakistan was on a better path 25 years ago, relatively poor governance, terrorism and increased militarization has had a severe impact on Pakistanis. While a military dictatorship has it's positives for the short term (up to a decade), in the long term it has been more damaging. Faiz on New Year Celebration....Ay Naye Saal Bata Tujh Mein Naya Kiya Hai ..
`In 2014, there were a handful of notable music festivals that were held in Lahore, Islamabad and Karachi. Six cases have been reported this year in the Federally Administered Tribal Areas, down from 56 in the same period last year. In October, a quarter-million children could not be reached by vaccination teams; the number dropped to 47,000 by May. One year after Pakistan’s army launched its offensive in the country’s northwestern tribal belt, Pakistani deaths from terrorist attacks are at an eight-year low but U.S. officials say more work is needed before the country can reverse its reputation as a top incubator of Islamist militancy. After a decade of bloodshed that killed more than 50,000 civilians and soldiers, Pakistan’s military finally became fed up last June when a homegrown militant group, the Pakistan Taliban, attacked Karachi’s international airport. In response, Pakistan’s air force and army began pounding North Waziristan, destroying two cities there while also ordering the evacuation of more than a million residents. Since then, the number of terrorist attacks in Pakistan has plunged as the Pakistan Taliban and al Qaeda appear to have fewer havens. 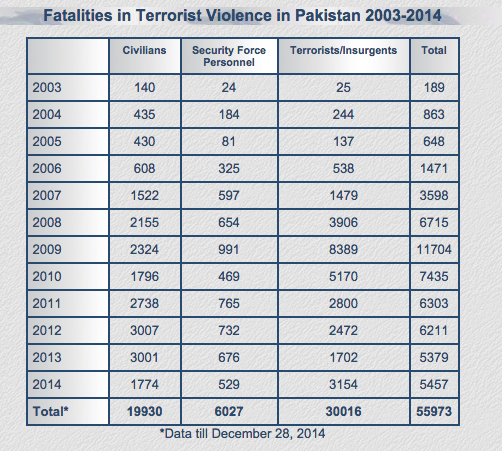 During the first five months of this year, 500 civilians died in terrorist attacks in Pakistan compared with 787 during the same period last year and 1,536 in 2013, according to the South Asia Terrorism Portal, which monitors violence in the region. The last time the start of a year was so peaceful was in 2007 — before the Pakistan Taliban emerged as a serious threat to domestic security. But analysts caution Pakistan still remains vulnerable to major terrorist attacks similar to the Taliban assault on the school in Peshawar in December that killed about 150 teachers and students. And whatever gains the Pakistan army has made are clouded by the perception that it simply shifted much of the problem across the border into Afghanistan — but the militants who are now there could easily migrate back into Pakistan with time. Though U.S. officials credit Pakistan for making serious gains against both the Pakistan Taliban and al Qaeda, there is less optimism about its efforts in combating groups such as the Haqqani Network and Afghan Taliban, which focus attacks on Afghanistan. And with tensions between Pakistan and neighboring India once again rising, few analysts expect Pakistani leaders to now follow through on their promise to also crack down on militant groups that have a decades-long history of carrying out attacks in India. There are also concerns that Pakistan still isn’t taking the threat posed by the Islamic State, which is trying to gain a foothold in the region, seriously. For many Pakistanis, however, there is little doubt that the year-long operation is starting to show signs of real success. As they’ve lost the ability to route money and resources through North Waziristan, and perhaps eventually Quetta, where much of the Afghan Taliban leadership resides, analysts say branches of the militant groups increasingly will turn to the Middle East based Islamic State for support. Of particular concern is that the conflict may then become even more sectarian in nature, similar to Islamic State’s offensive in Iraq. 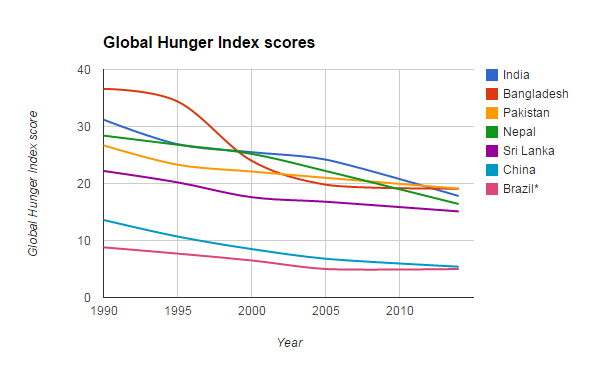 In 2008, there were only three countries that had a score worse than 3 out of 5: Somalia, Iraq and Sudan. However, by 2015 this increased to nine countries: Syria, Iraq, Afghanistan, South Sudan, Central African Republic, Somalia, Sudan, Democratic Republic of the Congo and Pakistan, highlighting the further deterioration amongst the least peaceful countries in the world. Crucially, the uncertainty stemming from the shift in responsibility for security from foreign troops to Afghan forces means that the chances of sustained internal conflict remain high. Pakistan’s score has similarly deteriorated, on the back of a worsening of its perceptions of criminality; as a result, the country remains second from the bottom in South Asia. The country’s dire domestic security situation continues to be hampered by the presence of Islamist militant groups. Even though the number of deaths from internal conflict did not worsen significantly over the past twelve months, Pakistan suffered a handful of high-profile incidents—most notably the separate attacks on Jinnah International Airport and an army-run school in Peshawar. Albeit not to the same extent, the number of casualties from internal conflict also rose in India where a Maoist insurgency stills runs rife. The downgrade in India’s score is tempered, however, by an improvement in political stability. The world’s second mostpopulous country witnessed an historic election in 2014 as the Bharatiya Janata Party secured India’s first one-party majority since the mid-1980s. TABLE 14 COUNTRIES WITH THE HIGHEST MILITARISATION IN 2015, INCLUDING PERCENTAGE CHANGE, 2008-2015 Israel has the highest level of militarisation in the world according to the GPI and is also the most militarised country in the world according to the GMI. The level of terrorism has grown steadily over the last decade, and shows no sign of abating. Deaths from terrorism increased by 61 per cent from 2012 to 2013, with almost 18,000 people being killed in terrorist attacks in 2013. Eighty-two per cent of these deaths occurred in just five countries: Iraq, Afghanistan, Pakistan, Nigeria and Syria. The majority of deaths from terrorism have occurred in countries suffering from protracted civil conflict or war, with 82 per cent of deaths from terrorism in 2013 occurring in just five countries: Iraq, Afghanistan, Pakistan, Nigeria and Syria. However, the impact of terrorism has been felt in an increasing number of countries across the globe, with the number of countries experiencing more than 50 deaths from terrorism in a year rising from 15 in 2012 to 24 in 2013. A total of 60 countries recorded at least one death from terrorism in 2013.